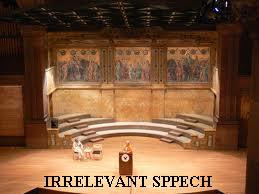 Today I am writing about a very funny speech called "Irrelevant Speech".It is a type of speech in which the sentences are not relevant to one another. Before writing the speech I will like to tell you a small story behind it. I was in first year and our seniors had arranged "Fresher's Party" to welcome all the newcomers. In this party there was a quiz game also to select Mr.Fresher & Miss.Fresher. But to get selected for the quiz game the students were ask to show some special talent. I was tense and wondered what special should i do to get selected and then my Dad give me the idea to deliver a irrelevant speech. Thanks to Dad that i delivered this speech , got selected and eventually won the Mr.Fresher title. You might not find it that funny but once you recite it and say in front of others,i bet they will love it.You can also use it at college or family programs. So friends here once again after almost 9-10 years i am presenting the speech ! वक्ता तो थे बहुत बडे पंडित जवाहरलाल नेहरू ! जुड़े में लगाया जाता है और फूलो का गुलकंद भी बनता है ! चीनी बड़े भयंकर होते है सन १९६२ में हमपर हमला कर दिया था ! जड खरबूजे की लम्बी होती है,खरबूजा खरबूजे को देखकर रंग बदलता है ! जैसे सोमवार ,मंगलवार ,बुधवार ! ४० शेर का १ मन होता है ! चंचल मधुबाला की छोटी बहन थी ! और मेरी भी तबियत जरा ठीक नहीं है !! इसलिए यही समाप्त करता हु !"